When you are a young, smart group, whose initial recordings are done without much supervision, there is a good chance your later albums will turn out sounding entirely different. This is the case with Northern California’s The Morning Benders. For the band’s follow-up to 2008’s Talking Through Tin Cans, group leader Christopher Chu takes on co-production duties with Grizzly Bear’s Chris Taylor. Attempting a lo-fidelity approach again (as on Tin Cans), Big Echo crackles with the hiss of purported vinyl. “Cold War (Nice Clean Fight)” is the most upbeat with a bouncy acoustic guitar and thrumming bass drum tightened by a simple chorus. “All Day Daylight” has a bit of a bite with edgy riffs and hand claps. But for the most part, Big Echo is slow and calculated, the rhythms moving at a leisurely pace. This unhurried attitude is also adopted by Chu’s vocals, which harmonize fluidly, reverberating with the others. Keeping with Tin Cans’ spirit of brevity, none of the songs on Big Echo take too long to get to the point — or labor it once they arrive there. 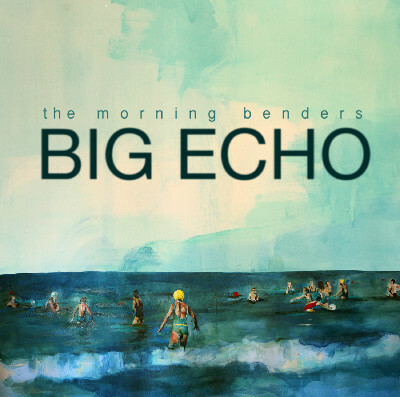 The Morning Benders may not win any originality points, but they have climbed up a few rungs on the songwriting ladder.